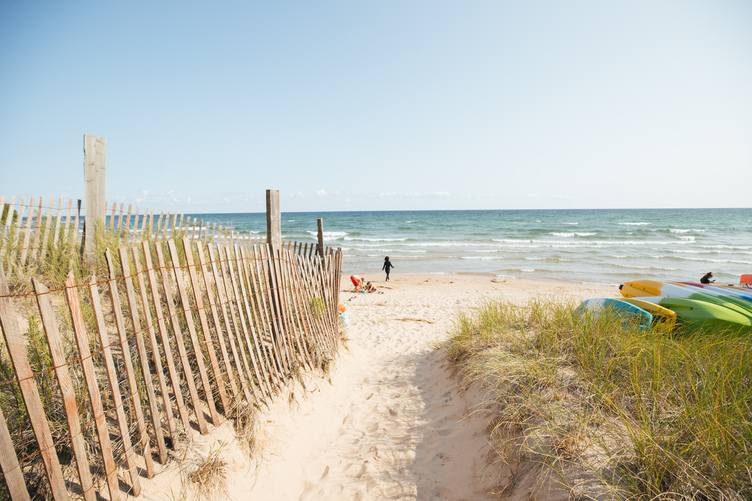 A long, narrow peninsula separating Green Bay from greater Lake Michigan to the east, Wisconsin’s Door County is framed by beaches and bluffs, ferry boats and historic brick lighthouses. The region is prolific, with rich limestone soil that feeds its famous orchards, and 482 kilometers (300 miles) of coastline, from which whitefish—a local favorite—is harvested year-round. For an insider’s look at this bountiful county, we asked the locals what to do when you visit. Here are some favorites. Surrounded on three sides by water, fishing is a year-round Door County pastime. In the winter, Green Bay is capped by several feet of solid ice, sturdy enough to construct little shanties on the lake’s frozen surface. Feeling adventurous? Rent an insulated 2.4-meter by 3-meter (8-foot by 10-foot) ice house, along with a whitefish fishing guide and gear, from the experts at Ice Fish Green Bay. Or, skip straight to the good part—the eating. For a delicious, quintessentially Door County tradition, locals are always eager to share the Scandinavian-style fish boil experience with outsiders. They recommend you arrive early, so you can chat with the boil master while he builds a wood fire beneath a massive caldron-like pot and fills it with locally-caught whitefish, potatoes and onions. Then, grab a drink and wait for the big finish, when kerosene is doused onto the fire and a 4.6- to 7.6-meter (15- to 25-foot) tower of flame shoots into the sky. It’s called the “boil off” and it clears the pot of the soot and fat that’s accumulated on top of the pot, leaving only perfectly cooked fish and clean broth behind. To see this spectacle in person, locals recommend the White Gull Inn, which hosts Friday night fish boils year-round (and four nights a week from May to October) on its patio. It’s a simple, hearty meal—served with melted butter and lemon, coleslaw and homemade bread—that you’d be a fool to miss. During the harvest months, locals love plucking fruit from the region’s many fruit trees. Each July, the tart Montmorency cherries are bright red and full of flavor—a revered Door County delicacy (some 10 to 15 million pounds are produced here annually). The fruit are turned into everything from cherry wine to cherry donuts, from a spicy, savory cherry salsa to the ubiquitous cherry pie that’s found at nearly every supper club and fish boil on the peninsula. To pick your own, Lautenbach’s Orchard Country Winery & Market is the spot. Once a year, the family farm hosts an annual festival with a pie-eating contest, horse-drawn wagon rides, bounce houses for the kids, wine-tasting and live music for the parents. For Door County color, you can’t beat the Cherry Pit Spit Competition, in which—you guessed it—participants compete to see who can spit a cherry pit the farthest. “Everyone has their own technique,” we’re told. The state record is 14.6 meters (48 ft). Can you beat it? Getting to Rock Island, one of Door County’s five state parks, requires not one but two public ferries, crossing “Death’s Door” (where the waters of Green Bay and Lake Michigan meet), and a stop at the 56-square-kilometer (35-square-mile) Washington Island, which is home to some 600 or so year-round residents. But 900-acre Rock Island is so tiny and remote island, it makes you “feel like you’re somewhere else.” Locals love that the island can only be explored by foot (neither cars nor bikes are permitted), which makes for great camping and hiking, stargazing and beach-going. It has the oldest lighthouse in the state and a beautiful stone boat house, which can be toured with one of the island’s volunteer docents. And once you’ve seen The Rock, the peninsula has another ten lighthouses you can explore! Fall’s arrival in Door County means the bluffs are ablaze with color. Locals recommend a drive along the Coastal Byway, which traces a path up the Western coast of the peninsula and down the sandy beaches of the Eastern shore. The route travels through villages, orchards and Fish Creek’s Peninsula State Park. For hiking, locals say the Eagle Trail’s 3.2-kilometer (two-mile) loop through terraced forests, colorful bursts of wildflowers, and along 46-meter (150-foot) cliffs is challenging but worth it. Or, for a very different trail experience, take the Door County Wine Trail and sip your way along the eight-winery route. From country inns to supper clubs, farm stands to fish fries, locals are proud of the fact that Door County is almost entirely devoid of national chains. “Almost all of our businesses are family-run mom-and-pop type places that you're not going to find anywhere else.” Among the area’s distinctly Midwestern charms are its supper clubs. These old-school spots are like restaurants, but “usually there’s wood paneling involved,” locals joke. As the humor suggests, supper clubs are downhome. There’s almost always a relish tray, maybe some deep-fried cheese curds with ranch dressing, probably a weekend fish fry or prime rib dinner, and usually Wisconsin’s classic cocktail of choice: an unpretentiously-prepared Old Fashioned. For the authentic supper club experience (since circa 1930s), locals will send you to the Nightingale Supper Club. Wisconsinites aren’t weather wimps. But some Sconnies—as locals have nicknamed themselves—are braver than others. Every winter, on January 1st, the 600 to 800 hearty souls in the Jacksonport Polar Bear Club hit the frigid waters of Lake Michigan for a brisk—some might say insane—swim. “It's a baptism of sorts to start the year. If you can do that, you can do anything else that the rest of the year throws at you.” For another wacky celebration of the season, the Fish Creek Winter Festival is an outdoor party held each January beneath a big tent along the lakeshore. There’s a chili cook-off, a toilet seat toss, a fun run, a bike toss, human foosball, a fruit loops run—an assortment of oddball activities designed to beat the mid-winter blues.